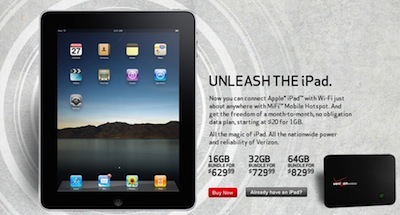 On Thursday, Verizon Wireless began selling Apple's iPad tablet bundled with a Verizon MiFi cellular hot spot. Beginning [October 28, 2010], Verizon Wireless customers can purchase the Apple® iPad™ at any of the more than 2,000 Verizon Wireless Communications Stores nationwide. Verizon Wireless will offer three bundles, all featuring an iPad Wi-Fi model and a Verizon MiFi™ 2200 Intelligent Mobile Hotspot, for a suggested retail price of $629.99 for iPad Wi-Fi 16 GB + MiFi, $729.99 for iPad Wi-Fi 32 GB + MiFi, and $829.99 for iPad Wi-Fi 64 GB + MiFi. Verizon Wireless is offering a monthly access plan to customers who purchase an iPad with a MiFi beginning at 1 GB of data for just $20 monthly access. In addition, Verizon Wireless will also offer all three iPad Wi-Fi models on a stand-alone basis. iPad customers can use the Verizon MiFi 2200 Intelligent Mobile Hotspot and Verizon Wireless’ 3G network to browse the Web, read and send e-mail, enjoy and share photos, watch HD videos, listen to music, play games, read e-books, and much more, all using iPad’s revolutionary Multi-Touch™ user interface on the go, wherever they are in Verizon Wireless’ nationwide 3G coverage area. The MiFi 2200 is small enough to fit in a pocket and allows customers to create a personal Wi-Fi cloud capable of sharing the high-speed Internet connectivity of the Verizon Wireless 3G Mobile Broadband network with up to five Wi-Fi-enabled devices. For more details, visit the Verizon Wireless website.